Trump May Declare National Emergency To Circumvent Congress On Wall Funding: "I'm Allowed To Do That" - Joe.My.God. President Donald Trump is seriously considering potential options to circumvent Congress, including declaring a national emergency, to reprogram funds from the Department of Defense and elsewhere to help pay for parts of his desired border wall along the U.S.-Mexico border, according to multiple sources familiar with the ongoing discussions. 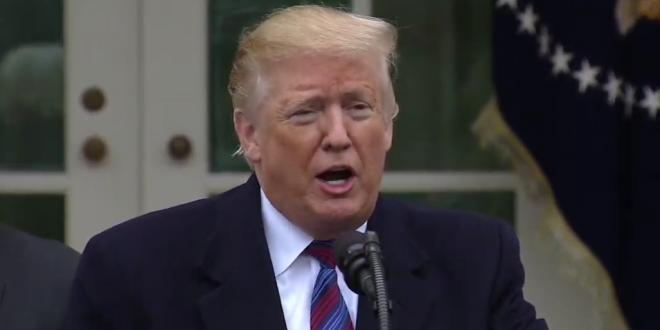 The president, when asked about ABC News’ reporting later on Friday during a press conference, acknowledged that he would consider granting himself national emergency powers to help get the wall built “for the security of our country”. He did not elaborate on the details of such a process. @realDonaldTrump just confirmed ABC News scoop that he's considering declaring a national emergency to get funding. "I am allowed to do that," he says. Others doubt that he is.